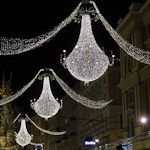 A Viennese Christmas is about the lights, the sights, and the smells, but also the sounds. Expect fewer sleigh bells and more violins, though – you’re in the concert capital of classical music, after all. Here are my tips for finding the best classical concerts, church recitations, choir performances and more to go with your roast chestnuts and mugs of Weihnachtspunsch during the Advent season. For a list of absolutely everything, try the official tourist office events calendar. The Kursalon has Strauss and Mozart Christmas concerts* from December 24 to 30. If you’re in Vienna on December 16, there’s a unique opportunity to see a harp masterclass and evening performance (for free) given by Anneleen Lenaerts of the Vienna Philharmonic Orchestra. Details here (you will need to reserve a seat by email). More info and tickets available at their website. Oh, and if you hang on past Christmas, there’s always the New Year’s Concert. The Konzerthaus also hosts “Christmas in Vienna”. This is the rather-apt title of a traditional gala music event held on December 21 (with a preview on December 20). International singers accompany the Vienna Boys’ Choir, the Konzerthaus’s own choir (the Wiener Singakademie), and the ORF radio symphony orchestra for a seasonal sing-song and feel-good evening of entertainment. The program can range from traditional carols and songs to pop classics, opera arias, and orchestral compositions. If you miss out on tickets, the national broadcaster (ORF) usually shows it on TV (as do many other countries, I believe). More info and tickets available at their website. The grand cathedral is the heart of the city and worth visiting in its own right. Soloists from the Vienna Chamber Orchestra will be performing works from the likes of Mozart and Bach, as well as Christmas carols, in a series of Advent concerts. More info: Website (German). Tickets are normally available from the usual ticketing agencies. Home to the Italian congregation in Vienna, this large gothic church also sits in the city centre. Unlike Stephansdom, the Advent concerts are a mix of different performers and works, with concerts nearly every day from late November through to the end of December in 2018. More info: Website (German & Italian). Tickets are normally available from the usual ticketing agencies. Tickets for the highlights mentioned above can be bought from the church vestry during opening hours. Another beautiful church in the centre and the traditional host for an exhibition of nativity scenes. There are two venues there. Concerts in the church itself are “free” (a donation is usually requested), those in the crypt tend not to be. The church mainly hosts organ and soprano recitals, with a mix of events throughout December, which you can find here (German, with some English). The crypt listings are here (ditto), with the most notable a Baroque Christmas concert on December 22. More info: Website (mainly German, some English). If tickets are required, they should be available from ticketing agencies. The Wiener Sängerknaben are quite busy at the end of the year. Their series of Advent concerts begin with a performance in their own concert hall on November 27. In-house Christmas concerts follow on December 11, 12, 13, 14, and 15. They’re also guesting at the Minoritenkirche (see above) on November 30 and at the Konzerthaus for the “Christmas in Vienna” event (also see above). More info and tickets from their concert hall website (for their in-house events). The choir’s website has a calendar of all their performances. Various international choirs tend to make guest appearances each afternoon at the Christkindlmarkt on the Rathausplatz.